With time and further technological development, maybe concepts such as the Flash2Pass garage door opener will become more prevalent in other aspects of living, too. I like this device because it eliminates something I previously had to carry, and further simplifies a routine task -- this thing opens the garage door for you, and all you have to do is flash your brights. For less than a hundred dollars and about a half hour of your time, you can wire the Flash2Pass to your bike. Once installed, you flash your bright lights twice to open, then twice to close the garage door. The range is about 75 feet, so once you're out of range, there won't be any accidental opening of the garage door. There's no separate remote control and no batteries to replace. Clean and simple. In addition, you can have six of the transmitters set up to open the same garage door -- just in case you have six bikes. 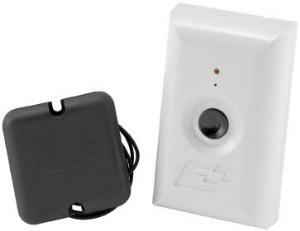 And, if you live in a gated community, the Flash2Pass can be set to open the entrance gate as well as your garage. Anywhere requiring electronic access, such as jobsites or restricted parking, can be programmed in. If you have access and permission, this device will allow you entry by flashing your lights. If you know it'll be your last ride for a while, hook it up to a battery tender or charger -- like this one from AccuMate.